Examiners dismissed the rise in top grades as “extremely marginal”, while Ofqual has underlined that results have remained steady. In 2012, 26.6% of exams were awarded As and A*s. And in 2017, 26.3% achieved these top grades. 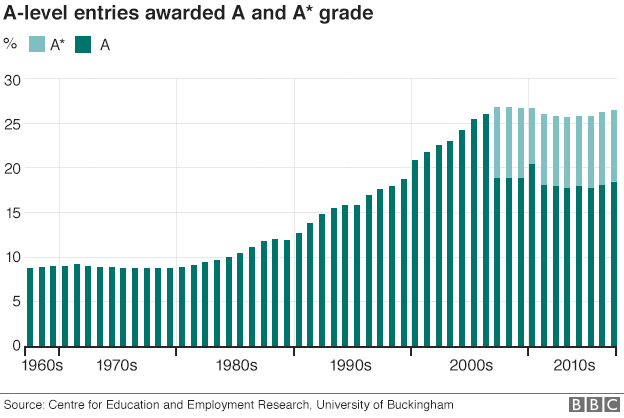 In England, A-levels have been moving away from coursework and returning to students being graded on final exams. However, a mix of old-style and new exams are being taken in Wales and Northern Ireland. Regulator Ofqual promised grade boundaries could be lowered, once papers were marked, if the new exams were tougher than expected. 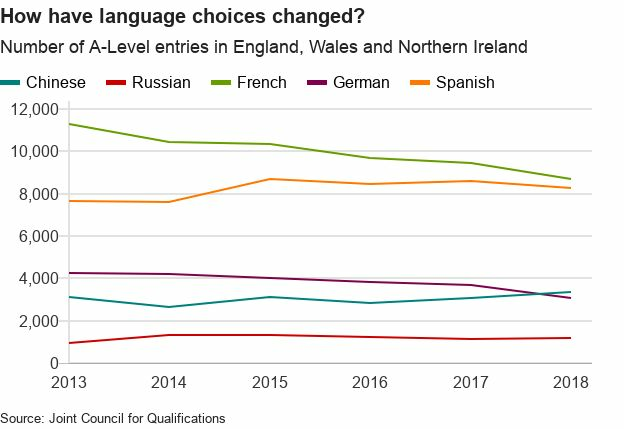 A-levels have also been separated from AS-levels in England, leading to a significant decline in the numbers sitting the separate exam at the end of the first year. What else do the results show? For the second year running, boys have outperformed girls at the top grades. Last year, this happened for the first time in 17 years, amid the move to the new-style exams. 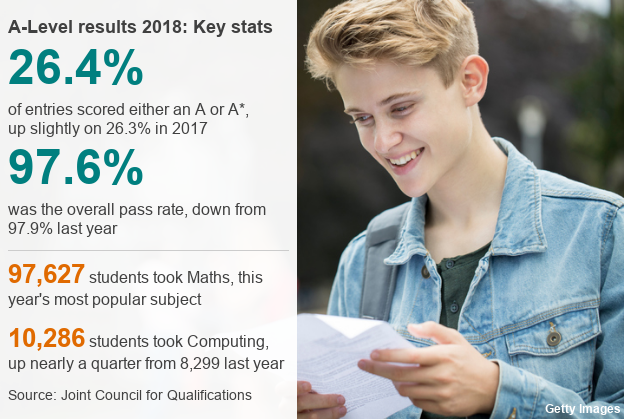 This year 26.6% of exam entries for boys were awarded an A or A*, compared with 26.2% of girls. This compares with 26.6% and 26.1% respectively last year. There has been a rise in the number of students taking Stem (science, technology, engineering and maths) subjects. These subjects accounted for over a third of A-level entries, but are still favoured by boys. Education Secretary Damian Hinds congratulated everyone receiving their results. He said: “It is the culmination of a lot of hard work and dedication – from both those receiving their marks and the teachers who’ve been supporting them every step of the way. But Geoff Barton, head of the Association of School and College Leaders, said the sheer weight of the changes had placed an intolerable additional strain on staff and students. “We have no doubt that this has affected the mental health and wellbeing of a proportion of young people and teachers,” he said. He urged the government to pay heed and ensure any future changes were introduced in a more manageable and considered manner. Ucas figures show 411,860 students have taken university places so far – down 1% on last year. But a record 27.9% of the 18-year-old population have already been accepted. Even the more selective universities are offering places to students through clearing which is the process by which universities fill their unallocated course places. There has also been a rise in unconditional offers and other ways of attracting students, such as bursaries. This year, 30,000 courses are available through the Ucas system. What about those not taking A-levels?